Large cat breeds are great and certainly have their merits. Large cats can be great companions! However, there’s something about a dainty little cat that makes us fall in love. Miniature cats are super adorable when they curl up in your lap, or fit perfectly into a tiny cardboard box to take a nap. 1. American Curls’ ears give them an almost cartoon-like cuteness. All members of this breed descend from one mother cat—a black stray who gave birth to a curly-eared litter in California, 1981. Nowadays, American Curls come in both short-haired and long-haired versions, with a wide variety of colors. Their main common characteristic is their ears that curl backward. Kittens of this breed are born with straight ears, which quickly begin to curl back, and are finished curling at about 16 weeks of age, growing up to be 5-10 pounds. American Curls are also super loyal and friendly—who wouldn’t want one of these cuties following them around the house? 2. The Cornish Rex—energetic, playful, and doesn’t shed! 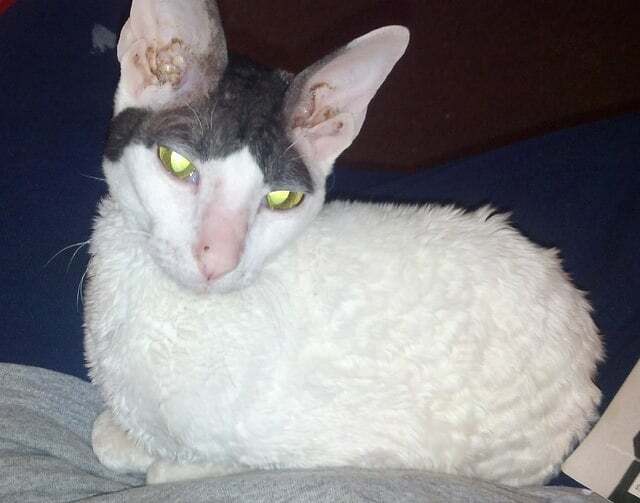 The Cornish Rex has an unusual coat of fur. Most cats (and furry mammals, for that matter) have two or three layers in their fur, but the Cornish Rex only has the bottom layer, making it sleek in appearance and velvety to the touch. 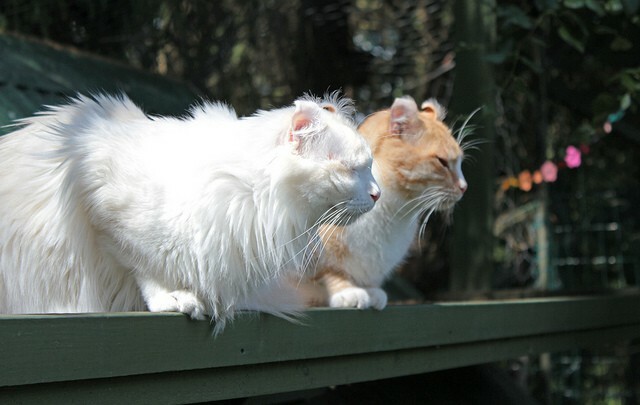 They are also one of the cat breeds that some people consider as hypoallergenic. This breed is perfect for those who want an active cat, as the Cornish Rex loves to play games and run around—some owners say their Cornish Rex acts like a grown-up kitten! The first Cornish Rex was born on a Cornwall farm in the 1950s. Modern Cornish Rexes come in all colors and grow up to be 6-10 pounds. 3. 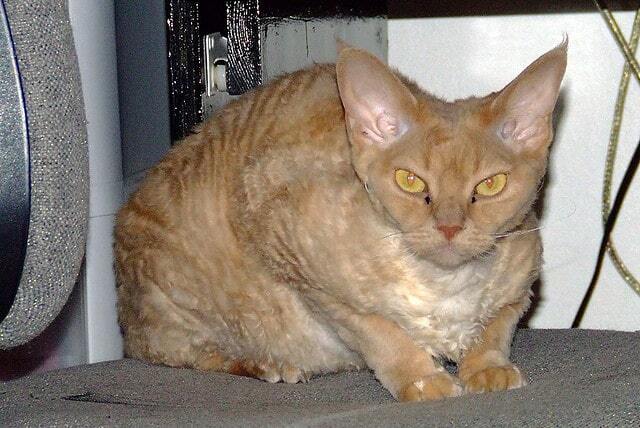 The Devon Rex is a great cat for those who prefer dogs. And that’s because it acts just like one! Loyal, intelligent, and social, they make a great companion for humans and other cats alike. Devon Rexes originate from a litter found near an abandoned mine in the UK in 1960. They come in many colors, but all feature the same small, mischievous face and adorable huge ears. They have a short, curly coat, and many people who are allergic to cats actually tolerate this breed quite well. The Devon Rex is a slender breed, averaging between 6 and 9 pounds. 4. Munchkins are simply adorable! Look at those little paws! Munchkins have much shorter legs than other cats, making them extra-cute as they scurry around your house. Although short-legged cats have been around for quite some time, the Munchkin itself originated from two pregnant strays rescued in Louisiana in 1983. Munchkins come in all coat lengths, colors, and patterns. 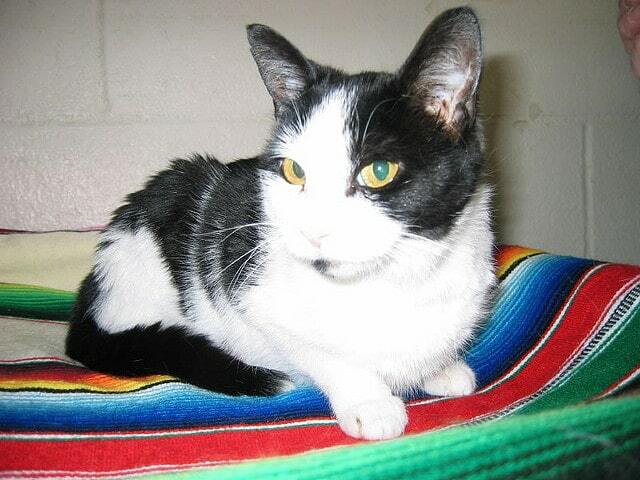 This cat is intelligent, sweet, and responds well to being handled, making it ideal for families with children. Munchkin kittens are super adorable, and grow up to be between 4 and 9 pounds, depending on gender, possibly making it the smallest cat breed. 5. A Singapura will be your lifelong best friend. 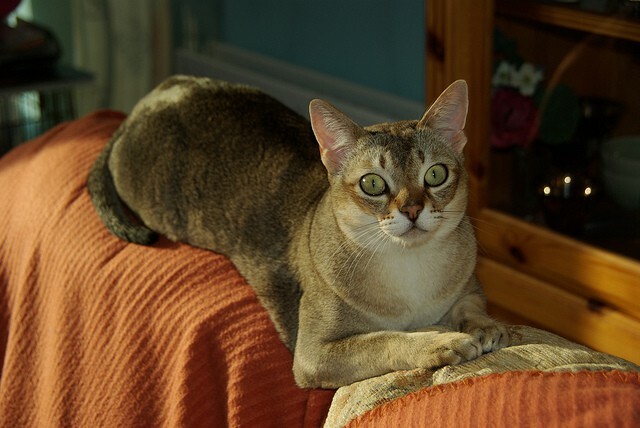 As the name may suggest, the Singapura cat breed originated in Singapore. It was introduced to the US in the 1970s, and is one of the world’s smallest cat breeds, weighing in at 5-8 pounds. Singapuras are active, playful, curious, and love humans. Older Singapuras don’t become grumpy old cats—their exuberant personality stays throughout their life. And although the Singapura is an active, curious breed, most owners will report that their Singapura is not a destructive cat. They have big ears, big eyes, and a sleek, muscular body. 6. The Minskin is the perfect combination of affectionate and independent. 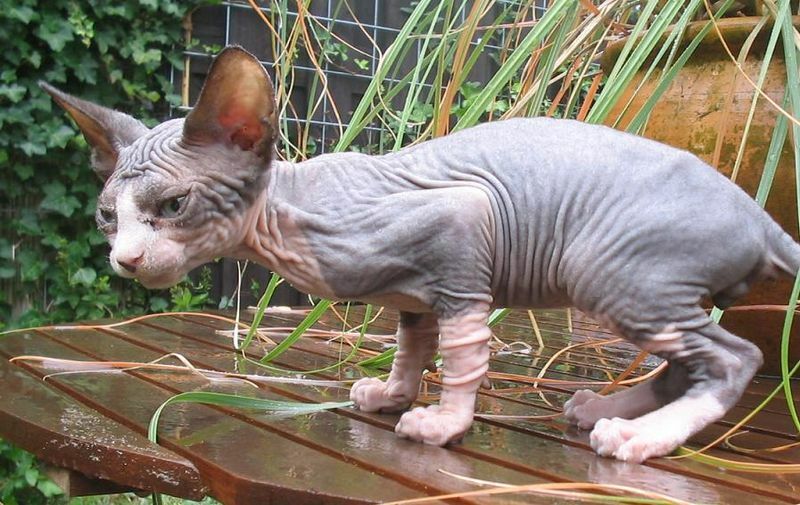 The Minskin is a very new small cat breed, originating in 1998 Massachusetts by breeding Munchkins and Sphynx cats together. The end result is a sweet, affectionate yet healthily independent cat that looks like a Sphynx, but with downy hair and shorter legs. The Minskin is a rather petite cat, weighing between 4 and 8 pounds. Minskins love dogs and get along very well with them. If you have a dog, or want an independent yet intelligent cat, a Minskin could be a perfect fit for your family. 7. A vocal, social Siamese will feel like a real member of your family. The Siamese breed has been around for over a hundred years, if not more. As the name indicates, the Siamese cat hails from Siam (nowadays known as Thailand). Modern Siamese cats have a slender body with elegant long lines. This cat is athletic, intelligent, and extroverted. They communicate in an almost human-like way, being very vocal and emotionally expressive. The size of Siamese cats vary widely, weighing in between 6 and 14 pounds. A smaller Siamese is a great choice if you want a small cat who feels like a real companion. 8. You’ll never stop having fun with an Oriental! If you like the idea of the personality of a Siamese, but prefer a wider variety of appearance, an Oriental would be a great choice. Orientals are closely related to Siamese, weighing around 7-14 pounds, but come in a very broad range of colors and patterns. They have a colorful personality, and like Siamese, they’re intelligent, talkative, love to play games, and crave social interaction with humans. 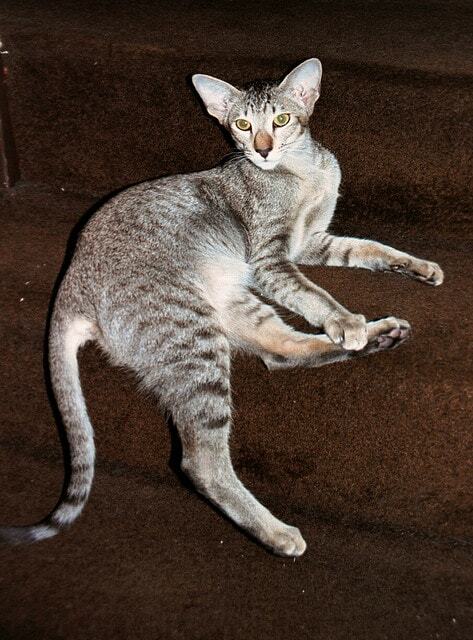 The Oriental is curious and determined—the type of cat to open your cupboards and snoop through your purse! 9. Napoleons are cuddly and precious, making them ideal for households with children. 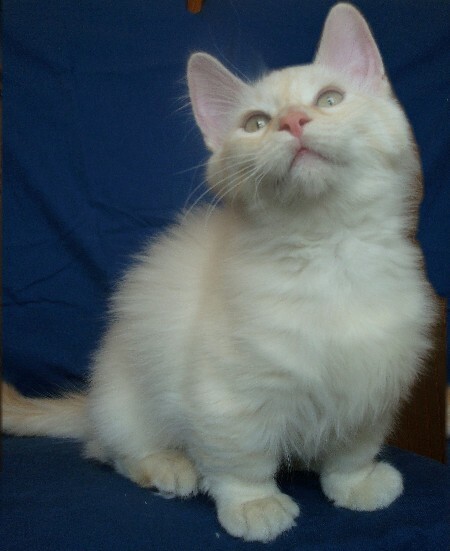 The Napoleon, also known as the Minuet, is one of the smallest cat breeds, and a new one! This breed was created by crossing a Munchkin with a Persian. Their appearance can vary, and not all of them have the short legs of a Munchkin, but generally they look like a fluffy, stubby-legged Munchkin cat with the flat face of a Persian. Weighing 5 to 9 pounds, they’re one of the smallest breeds. Their personality is enthusiastic, active, and playful, and are known to be a good cat breed for children. 10. The Japanese Bobtail loves to play and do tricks. 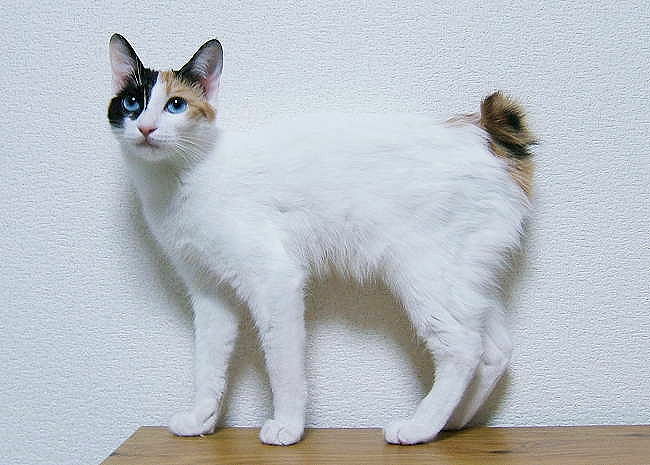 The Japanese bobtail is a very old breed of cat, dating back hundreds of years. They’re native to Japan, and are distinguished by their very short tail. This breed is active, intelligent, vocal, and attentive. The Japanese bobtail is much better at performing tricks than most breeds, and is also easy to train to walk on a leash. Many owners of this breed also report that this type of cat is fond of water. Males of this breed weigh between 8 and 12 pounds, with females generally weighing less than 8 pounds. 11. The Burmese is like a gentler, kitten-like Siamese! 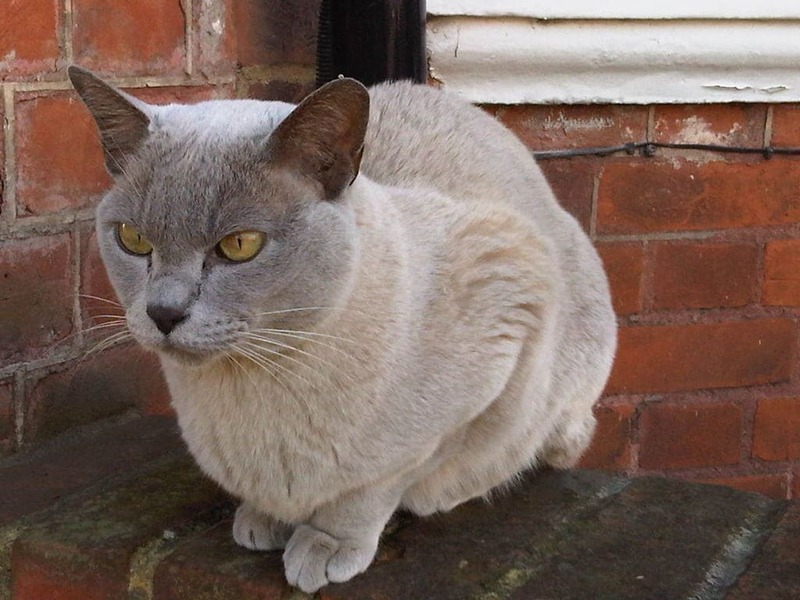 The Burmese cat breed is mostly descended from one female, from Burma, who was brought to America where she bred with a Siamese male. 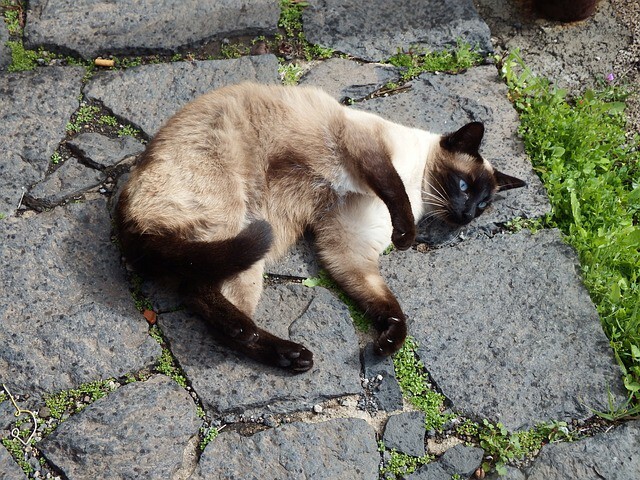 These cats are social, playful, and vocal, but with a softer voice than their Siamese cousins. They maintain a kitten-like disposition throughout their life, and often like to play games. Burmese cats have a noticeably stocky build, yet only weigh 4-13 pounds, and have a short coat that comes in a variety of colors and patterns. 12. LaPerms have the cuddliest, curliest coat of fur you ever did see. 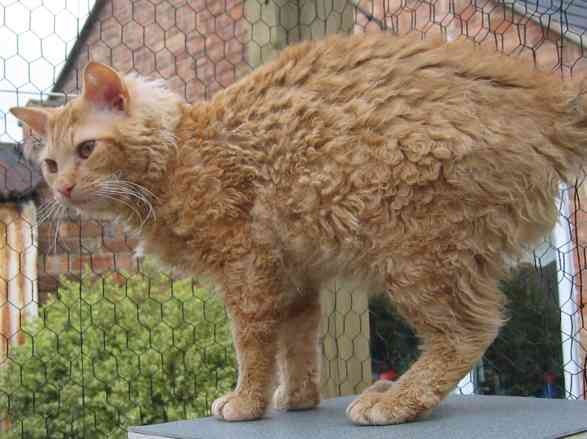 The LaPerm breed of cat originated on a farm in Oregon in the 1980s. These cats are very affectionate and outgoing. Although they tend to be a more active cat, they’re also content to snooze on your lap all day. LaPerms are distinguished by their unusually curly coats. Short-haired LaPerms will have a rippled appearance, while long-haired LaPerms may sport ringlets of fur. Despite their abundance of fur, the LaPerm is more hypoallergenic and they are cats that don’t shed much than other breeds. This breed weighs between 8 and 12 pounds, possibly less for females. 13. 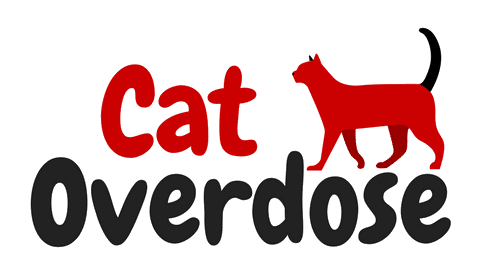 A Turkish Angora will love you forever! The Turkish Angora is one of the oldest cat breeds, distinguished by its long, silky coat, which despite its length requires minimal grooming. They weigh about 8 to 12 pounds on average, and they’re playful, intelligent, athletic, and easily trained. They’re also one of the most affectionate cat breeds, oftening select one family member in particular to be attached to. So, if you live alone, a Turkish Angora will be very loyal to you. They get along well with other pets, but tend to be the alpha pet in the house due to their assertive nature. Did any of these cat breeds call out to you in particular? Personally, I can’t decide which is my favorite, since I love all mini cats! If you enjoyed learning about these cute miniature cats, tell us what you think in the comments and share this article with your fellow cat-loving friends!